Exhibition, November 2014: Friends’ ambulance unit and Friends’ relief unit | Southern Marches Area Quaker Meeting. 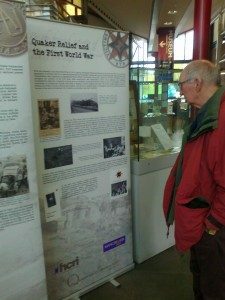 Ludlow Quakers are mounting an exhibition on the work in World Wars I and II of the Friends’ Ambulance Unit and the Friends’ Relief Service. The display in Ludlow Library is a professionally-produced exhibition made by the Humanitarian and Conflict Response Institute, University of Manchester. It is packed with factual accounts, images and the human stories behind the work of the FAU and FRS. The exhibition runs all through November, closed Sundays, admission free. FAU and FRS were Quaker organizations for conscientious objectors and also others who wished to make a practical but non-violent contribution to alleviating suffering during the wars. World War I began on 4 August 1914. Meeting for Sufferings met in London three days later to consider their response. Outside the official sessions, a group of Young Friends worked on the idea of an ambulance unit. They were convinced that ambulance services would be woefully inadequate, so that offering such services could save many lives. It would also enable conscientious objectors to make a vital contribution. There was no conscription then, so none of them had to get involved – their response came from their commitment to participating in a nonviolent way. Not all Quakers of service age during the First and Second World Wars registered as conscientious objectors, however: some saw no alternative to service with the Forces. Philip (Noel) Baker appealed for volunteers for the FAU in a letter to the Friend of 21 August. Early in September the first training camp took place at Jordans, in Buckinghamshire, for about 60 young men. Initially neither the British Red Cross nor the British army wanted to involve a group of independent and pacifist volunteers, but the situation changed dramatically when the Belgian army collapsed in late October. The FAU was provided with equipment and supplies, and a party of 43, led by Philip Baker and including Corder Catchpool, left for Belgium. A few miles out they met a torpedoed and sinking cruiser; they rescued the victims, and carried them back to Dover. Setting out again, they came to Dunkirk, and worked for three weeks in the military evacuation sheds, looking after several thousand wounded soldiers until they could be evacuated on hospital ships. The Unit set up their administrative headquarters nearby, at Malo les Bains. There was a terrible typhoid epidemic that winter, and this led to the establishment of the first of four hospitals, the Queen Alexandra, at Dunkirk. The FAU expanded as the needs grew, and many non-Quakers joined: it was open to people of all denominations. There were two sections: the Foreign Service and the Home Service. After the initial emergency at Dunkirk, the Foreign Service started on a programme of civilian relief in France; they were soon noticed by the French army medical headquarters, and this led to the staffing and running of French ambulance convoys (Sections Sanitaires Anglaises), and helping in both civilian and military hospitals. In 1915, they started running ambulance trains, and in early 1916 they had two hospital ships. The Home Service set up and/or helped to run four hospitals in England. Two were in Quaker premises – one in part of the Rowntree factory in York, and the other in a Cadbury house in Birmingham; the other two were in London. They had an office in London, a clothing department, and ran training camps, mostly at Jordans. Late in 1915, when Italy came into the war, the Anglo-Italian Ambulance Unit was set up separately. Several FAU members, including Philip Baker and his wife, nurse Irene Noel, worked in Italy for the rest of the war. In August 1916 the Military Conscription Act caused a sudden influx of conscientious objectors, and a General Service section was started to offer them alternative training, if required. In 1917, when the US came into the war, and the American Friends Service Committee (AFSC) was set up, several Americans joined FAU, while many others were involved in similar work with the Red Cross. FAU continued with these many different kinds of work, both in England and on the European mainland. There were eventually at least eight hospitals in France and Belgium staffed by the FAU. At the end of the war in 1918, the FAU had 640 men working on the continent and 720 men in Britain. 21 died in action, and a further 420 were involved at some stage during the war. They had driven over two million miles and had transported 277,000 sick and injured people. If the work of the Italian unit is included, these figures increase by about 50%. Their funding (about £140,000 in total) had come from Quakers and many other sources. Women served as nurses in the Queen Alexandra Hospital in Dunkirk and also with the Anglo-Italian Ambulance Service. One hundred and two women served in the FAU out of a total of 1800, 54 of whom served abroad. FAU’s unofficial motto was ‘Find work that needs doing. Regularise it later, if possible’. In the heat of the conflict, that is exactly what they did. They were never officially regularised, but it did not matter. After the armistice in 1918, the Unit worked for another year on civilian relief and repatriation. FAU was finally laid down in 1919. However, the concept was revived in WW2, when over 1,300 young men and women served in 25 countries in Europe, Africa and Asia to build ‘a record of goodwill and positive service’. In September 1939, Paul Cadbury and Arnold Rowntree (members of the Friends Ambulance Unit during the First World War) re-formed the Unit with the intention of again enabling conscientious objectors to undertake civilian service in a military context. One of the aims of the Unit was to assist those COs who were not members of the Society of Friends, and thus less likely to be granted exemption from military service. Over 1,300 members served with the FAU between 1939 and 1946, including 97 women. All FAU recruits attended a six-week training course in Birmingham, which included practical sessions provided by medical and nursing staff, lectures from former FAU members, specialised training in motor mechanics, and physical training exercises with route marches. It was made clear that members must be prepared to “Go anywhere, do anything” in the course of their service. Seventeen members lost their lives in the Second World War. The FAU began overseas work in 1939, in Finland following the Soviet invasion. In 1941, FAU members undertook medical relief work with the British Red Cross in Greece. Later that year the German army captured sixteen members of the Unit and transferred them to prisoner-of-war camps in Germany. Many FAU members served in mobile military units with the British and French armies. In 1942 Raymond (Nik) Alderson, serving with one of the Free French Forward Theatre Units, was killed by a German bomb whilst sheltering in a trench. The FAU subsequently followed the Free French army as it advanced from the Middle East into Italy and France. Although the FAU officially disbanded in 1946, many members continued to serve overseas with different organisations. The FAU’s remit passed to the Friends’ Service Council. 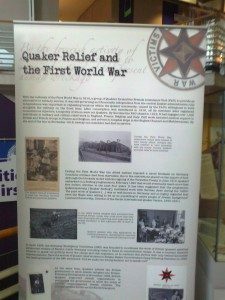 The Friends War Victims Relief Committee (FWVRC) was an earlier official arm of British Quakers, set up in times of war to relieve civilian distress in practical ways. It was first established in 1870, following the outbreak of the Franco-Prussian War and revived twice more (in Bulgaria in 1876 and in the Balkans in 1912) before being formally reconstituted again at the outbreak of the First World War. It was revived for a fifth and final time in 1940, before its name was changed to the Friends Relief Service in 1941. FWVRC commissioners worked through the local communities in Paris and the Loire Valley and around Metz, providing emergency famine relief and helping to plough fields and sow seed in devastated agricultural areas. In the First World War the FWVRC worked in parallel with the FAU, but was very different in character. Unlike the FAU, it was an official arm of the Society of Friends in Britain, although those serving were not necessarily conscientious objectors or Quakers. Far more women served with the FWVRC than in the FAU. (156 women served abroad during the War and 880 in the aftermath.) It was also, according to John Ormerod Greenwood, a more utopian organisation, dreaming of radical social change. Organised FWVRC training began in 1914 under Roderick Clark. Ruth Fry, who had worked as Treasurer of Boer Home Industries, was appointed secretary. From 1915 until after the armistice, the FWVRC worked in the Netherlands in camps set up for Belgian refugees and other civilians. In France, the FWVRC took charge of hospitals and convalescent homes and provided district nursing care as well. Two hospitals were set up in Sermaize, in a district almost razed to the ground following the first German offensive. Pre-fabricated houses were again used, this time to replace homes that had been destroyed. As in the Franco-Prussian War, the FWVRC helped to bring in harvests that would otherwise have been lost. In Chalons sur Marne, Hilda Clark and Edith Pye set up an urgently needed maternity hospital in one wing of an old people’s home. In 1917, with the entry of the United States into the War, the FWVRC were joined by members of the newly founded American Friends Service Committee. Together they took responsibility for the reconstruction of a 200 square mile area of Lorraine, near Verdun. In Serbia, they rebuilt two villages, an orphanage, a hospital and two dispensaries. Margaret McFie, a Scottish doctor, built the first school for the blind in Yugoslavia, while another Scottish doctor, Katherine McPhail, opened a children’s hospital. During the famine of 1921-24 FWVRC and American Quakers supplied food aid to more than half a million starving people in Russia, and then mounted a reconstruction programme. Following the outbreak of the Second World War, the FWVRC was revived for the fifth time, in late 1940. Its secretary was Roger Wilson and it had around 500 full and part-time members. During the war the name was changed to the Friends Relief Service (FRS) – a name that was felt to sound less pompous. The FRS was one of many organisations to provide post-war relief to Europe; in the field it worked alongside other voluntary societies and the newly founded United Nations Relief and Rehabilitation Administration (UNRRA) – with which it sometimes had uneasy relations, because UNRRA’s responsibility was to governments rather than to the needs of those with whom it was working. The 1200 people, men and women in equal numbers, who joined FRS teams came from a variety of backgrounds. Not all were conscientious objectors, and the majority were not Quakers. Like those in the FAU, members accepted that, aside from a small sum of pocket money, their positions would be unwaged. FRS members attended training centres in England before undertaking relief postings; courses focused on role-play and the practical application of knowledge. Lectures provided by experienced relief workers instilled individuals with an appreciation that what looks “good on paper” might prove unfeasible in the harsh realities of post-war Europe. The Quaker star on the grey FRS uniforms served as a symbol of continuity with earlier service by Friends. Members could never cease to be aware that they were carrying out their pacifist service following military action by Allied forces. For more details of FAU and FRS work please see http://www.quakersintheworld.org/quakers-in-action/252; http://www.quakersintheworld.org/quakers-in-action/298 and http://www.qsmt.org.uk/friends-relief-service. i am writing a 5000 word easy compering the ambulance service today to the ambulance services in ww2. one of my main areas of interest is the friends ambulance service i was wondering if you could provide me any information on the training they had to go through and any statistical data.